There is a reason why the great helmet was fairly unquestioned as the supreme level of defense that a warrior could wear to protect his skull. And that was because great helms, like this Sugar Loaf Helmet, surrounded the wearers head with plate metal. Nothing is impervious, but this helmet is quite close to it, possessing a superb level of defense against both slashing and bludgeoning weapons. 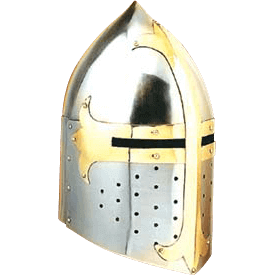 The sugar loaf helm is a variant of the great helm, featuring a conical cap that helps to further divert the force and angle of a blow away from the crown of the head, which helps to keep the wearer relatively safe even when under attack. The helmet is made from quality steel and features an ornate brass cross decoration on the front, as well as narrow eye-slits to allow the wearer to see, as well as various little holes which help to ventilate the helmet, while also making it easier for the person inside the helmet to breathe. Donning this Sugar Loaf Helmet is a great way to put yourself into a medieval mindset, and it is also a great way to give yourself an authentic medieval look, especially when paired with knightly armor like plate and chain.